Angel food cake was my go-to dessert in college. Mainly because it was a tad healthier than your average cake, but also because the boxed cake mix made it easy to make at home. Angel food cake has a reputation for being difficult to make from scratch. But I'm here to tell you, it's really not! It definitely took me a while to build up the courage to ditch the boxed mix and make it from scratch, but once I did I realized it really isn't so bad. Plus, when you make it from scratch at home you can play around with the recipe and make it your own! Like adding in blueberries! Which make a super delicious and subtly flavored blueberry angel food cake. First things first. Process the blueberries until they form a fine powder. You can do this by processing them in a food processor or by tossing them in a zip-top bag and giving them a good wack. Next, sift all the dry ingredients together. It's super important to sift everything because you want it to be as light as possible. Then start making the meringue which is the foundation of the cake. Slowly start beating the egg whites until a little bit of foam forms, then add the cream of tartar and lemon juice. After a little more foam builds, add in about a third of the sugar. Beat for another 30 seconds or so and add a little more sugar. Finally, when the egg whites are almost done, add in the rest of the sugar. The meringue should be in medium stiff peak form, meaning it can form a peak, but the tips fall over. Now slowly fold the dry ingredients into the meringue a little at a time. Try not to deflate the meringue. 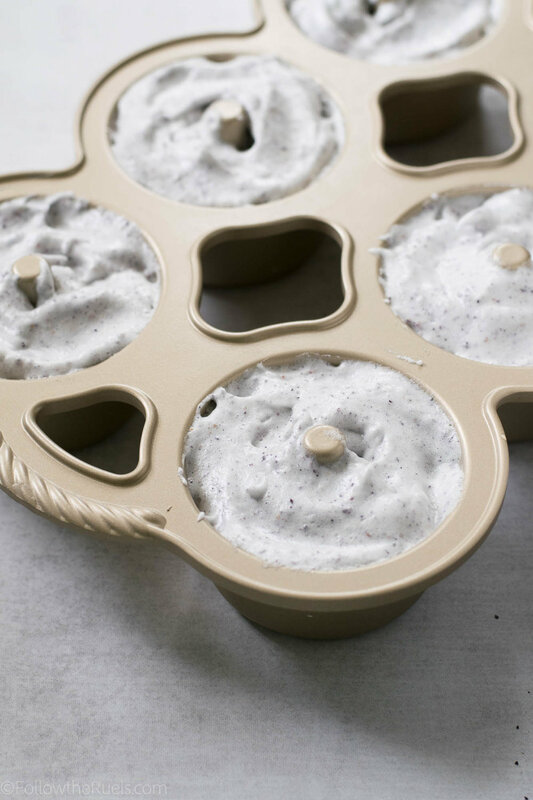 Spoon the batter into your cake pan, or in my case, a mini cake pan, then bake until a toothpick comes out clean. It takes about 15-20 for the small pan and 30-35 for a standard pan. Once out of the oven, let the cake cool upside down over a cooling rack or balanced on a wine bottle. This helps ensure that your cake doesn't deflate and lose all that beautiful air you worked so hard to incorporate into the cake. 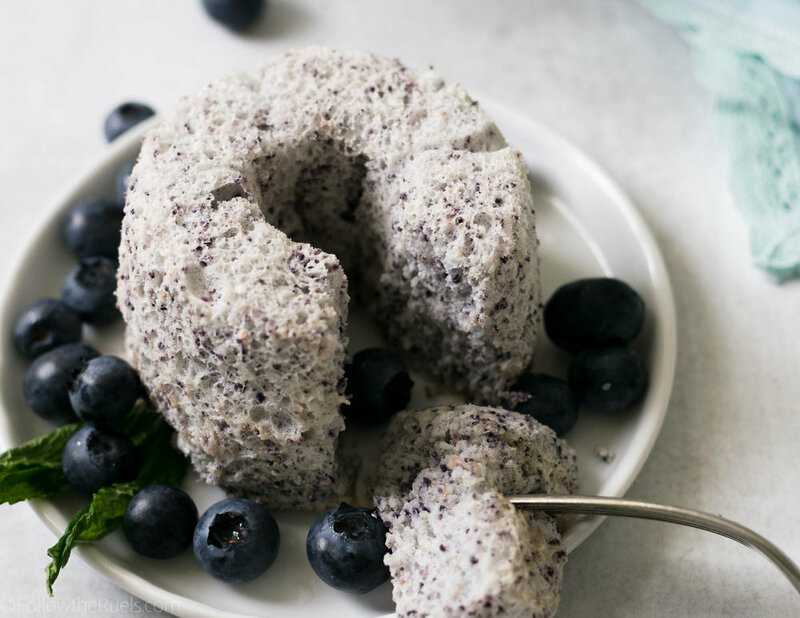 If all of those things are done well, you should have yourself a beautiful, light, airy, and delicious blueberry angel food cake! Perfect for any occasion, or just to make for yourself. You definitely don't have to worry about the guilt with this recipe. It is about as "light" as any cake can be! Plus, it probably packs a full serving of fruit thanks to those freeze-dried blueberries. Pour freeze dried blueberries in the work bowl of a food processor and process until completely fine. Alternately, if you do not have a food processor, place blueberries in a zip top bag and smash with a spoon or back of a pan until a fine powder forms. Sift blueberry powder, flour, and half of the sugar into a bowl. In a separate bowl add egg whites and cream of tartar. Mix on high speed until a foam forms. Add in lemon juice, water, and 1/4th of the remaining sugar. Keep mixing for another 30 seconds, then add in a bit more sugar. 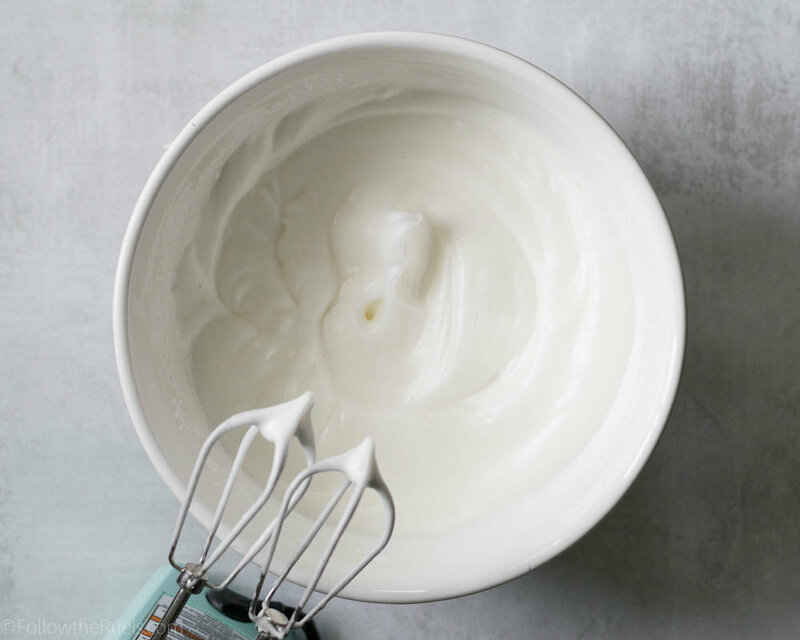 Keep adding the sugar every 30 seconds to 1 minutes, until the egg whites have formed a medium stiff meringue, meaning the egg whites form a peak, but the tips fall over. Sift about a third of the flour mixture over the egg whites. Gently fold in until mostly combined. Add in half of the remaining flour and repeat. Then add in the rest of the flour and fold until egg whites and flour are completely combined. Spoon the mixture into an angel food cake pan or mini pan. Bake for 20 minutes for the mini cakes or 35 minutes for a large cake, or until a skewer inserted halfway between the center and the wall of the pan comes out clean. Let the cake cool upside down on a wire rack or balanced on a bottle until cooled to room temperature. If you do not have caster sugar, process granulated sugar in a food processor until fine.